Kadence Creations, LLC has updated the price of their app, MLMipedia Pro, to $3.99. Fresh off of their latest update of more companies and enhanced features, Kadence Creations decided to lower the app's price in order to make it more affordable. MLMipedia Pro enables people to choose the best network marketing company for their specific criteria. At the end of the day, the more users who can benefit from the unique information our product provides, the better. Choose the perfect network marketing company for your needs, now for a lower price. MLMipedia Pro launched in late 2011 to give people a better tool when searching for the right network marketing company. There are hundreds of MLMs to choose from, each with unique products and compensation plans. MLMipedia Pro helps narrow down the search with exclusive features to compare and contrast companies. Kadence Creations' founder, Craig Stluka, discussed this recent price reduction, "we decided to make an aggressive move and lower our price from $9.99 to $3.99. Sales have been as expected, but we want to offer the value of MLMipedia Pro to more people, and felt that lowering the price made sense." The iPhone App store has numerous choices for the users' consideration, so by charging a lower fee, MLMipedia Pro becomes a more affordable tool. 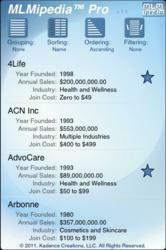 People are continuously turning to the network marketing industry for extra money or even a change in career. MLMipedia Pro helps people choose which company is right for them, and now with its lower price, MLMipedia Pro will be available to even more people. "At the end of the day, the more users who can benefit from the unique information our product provides, the better," continues Stluka. "We hope our new price will echo our commitment to making solid research affordable to anyone interested in finding it."